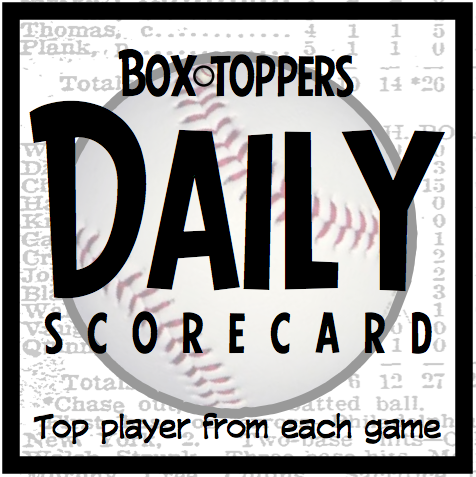 Yankees pitcher Masahiro Tanaka is Friday’s Box-Toppers Player of the Day, earning the highest Box-Toppers game score of the season. Also Friday, Nationals pitcher Stephen Strasburg rises to fourth place in Box-Toppers season player rankings after earning National League Player of the Day honors. Player of the Day—Tanaka struck out 15 over seven scoreless innings, allowing three hits and no walks in the 4-0 win over the Blue Jays. Tanaka earns 2.0 Box-Toppers points for being Player of the Day, giving him 11.4 for the season. He ranks 23rd among all players and eighth among American League pitchers. Tanaka is the 36th player this season to reach 10 or more Box-Toppers points. It is the third season he has reached 10 points. In 2014, he had 12.7 with the Yankees and in 2016, he had 14.1 with the Yankees, which ranked fifth among AL pitchers. National League Player of the Day—Nationals pitcher Stephen Strasburg struck out eight over 7 2/3 scoreless innings, allowing two hits and two walks, in the 6-1 win over the Pirates. Strasburg earns 1.7 Box-Toppers points for being NL Batter of the Day, giving him 22.5 for the season, rising from eighth to fourth place in season player rankings. He ranks third among NL pitchers, behind teammate Max Scherzer (25.0) and Dodgers pitcher Clayton Kershaw (23.1). Strasburg now has 105.4 career Box-Toppers points, rising to 66th place among all players since 1995, when Box-Toppers tracking began. With his points Friday, he passes three players on the “all-time” list—Jamie Moyer (104.0), Dodgers pitcher Scott Kazmir (105.1) and Astros pitcher Francisco Liriano (105.2). He trails 65th-ranked player Aramis Ramirez (105.8). American League Batter of the Day—Brian Dozier of the Twins hit a three-run homer and doubled in the 6-3 win over the Tigers. Dozier went 2-for-3, scoring twice. National League Batter of the Day—Ian Happ of the Cubs hit a three-run homer and went 2-for-4, scoring twice and driving in three runs, in the 5-4 win over the Reds. Box-Toppers points lead—Max Scherzer and Clayton Kershaw have one final chance Saturday to take the Box-Toppers points lead and win 2017’s Box-Toppers Player of the Year honors. Scherzer of the Nationals (25.0 Box-Toppers points, ranked second) starts Saturday against the Pirates and Kershaw of the Dodgers (23.1 Box-Toppers points, ranked third) starts Saturday against the Rockies. Both players trail current Box-Toppers points leader, Red Sox pitcher Chris Sale, who has 25.1 points for 2017. Box-Toppers team rankings—With two days left in the season, the race for top spot in Box-Toppers final team rankings is down to two teams, but the Cleveland Indians could wrap up the title with a win Saturday. The Indians won Friday, adding 1.0 Box-Toppers point and now lead the Dodgers by 3.5. If the Indians add one more Box-Toppers point Saturday or Sunday, they would have at least 140.9 points, putting the lead out of reach of the Dodgers, who could only earn 4.0 more points (earning Player of the Day honors, worth 2.0 points, both Saturday and Sunday), giving them 140.4. Meanwhile, the Dodgers lost Friday, keeping their total steady. The Nationals won, with Strasburg earning NL Player of the Day worth 1.7 points and move within 1.1 point of the NL leading Dodgers. Top 10 watch—Diamondbacks pitcher Zack Greinke (20.1 Box-Toppers points, ranked eighth) did not earn Player of the Game Friday in his team’s 2-1 loss against the Royals. Greinke (4IP 6H 2R 2BB 4K L) had a Box-Toppers game score of -4.0. Player of the Game was Royals pitcher Ian Kennedy (5IP 4H R BB 7K W) with a Box-Toppers game score of +5.0. Notable—Brewers pitcher Chase Anderson became the 37th player this season with 10 or more Box-Toppers points after earning Player of the Game honors Friday. Anderson (7IP 3H R BB 5K W in the 5-3 win over the Cardinals) earns 1.0 Box-Toppers point, giving him 10.4 for the season. He ranks 33rd among all players and 15th among NL pitchers. Debut—Jorge Alfaro of the Phillies made his Box-Toppers debut Friday with his first career Player of the Game honor. Alfaro (HR 2B 2-3 R BI in the 6-2 win over the Mets) made his Major League debut Sept. 12, 2016, and was playing in his 34th career game. He is the 3,920th player to debut in Box-Toppers since record keeping began in 1995. Scoring—Tanaka earns 2.0 Box-Toppers points for being Player of the Day and Strasburg earns 1.7 points for being NL Player of the Day. Dozier and Happ each earn 1.5 points for being their league’s Batter of the Day. All of Friday’s other Players of the Game (listed in the chart below) earn 1.0 Box-Toppers point.